Liz Howard’s debut collection, Infinite Citizen of the Shaking Tent, won the 2016 Griffin Poetry Prize, and was selected as a finalist for the 2015 Governor General’s Award for Poetry. Infused with insight and musicality, her inventive, experimental, lyrical work explores the construction of selfhood from multiple angles. 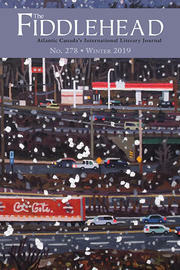 The Griffin judge’s citation notes that her poems “are filled with energy and magic, suspended between competing inheritances, at home in their hyper-modern hybridity.” Born and raised on Treaty 9 territory in northern Ontario, Liz Howard often includes images of that landscape in her work. She received her Honours Bachelor of Science with High Distinction from the University of Toronto, the institution where she subsequently worked as a research officer in cognitive psychology. She earned her Master of Fine Arts in Creative Writing from the University of Guelph. In the fall of 2018, she will begin her role as Writer-in-Residence at the University of Calgary. 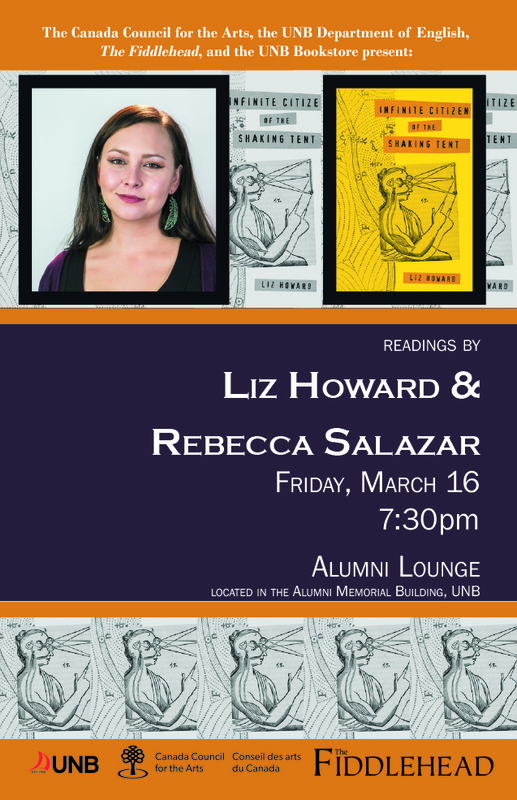 Rebecca Salazar, Vanier scholar and PhD candidate at UNB, is the author of the poetry chapbook Guzzle released by Anstruther Press. Her work has appeared in The Malahat Review, Lemon Hound, and Partisan, and her poem “Geography Lessons” recently won the Writing in the Margins contest at Briarpatch. She edits for Qwerty, The Fiddlehead, and Plenitude Magazine. The reading, sponsored by the Canada Council for the Arts, the UNB Department of English, the UNB Bookstore, and The Fiddlehead, is free and open to the public. Refreshments will be served.